Business services organizations, such as marketing agencies, law firms, accountants and advisory services, often deal with very sensitive client information, including personal information and intellectual property. To earn and maintain client trust, they must make the security and integrity of this data one of their top priorities. In addition, they often need to comply with multiple regulatory standards, including those that they are subject to directly and those that their clients are subject to. 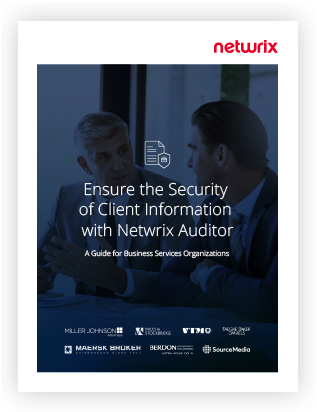 This eBook details how Netwrix Auditor can help your organization become more resilient to threats that put your sensitive data at risk and pass compliance audits with less effort and expense. How can you detect account and privilege misuse? How can you improve detection of insider and external threats to your sensitive and business-critical data? How can you prove compliance with less effort and expense?